Old Crossleyans eased to a comfortable 47-7 victory over Bradford Salem in their final home game of the season. The bonus point was achieved by half time and a further three tries in the second half completed a convincing performance against visitors who made several changes to their intended starting line up. A number of other try scoring chances went begging but home supporters enjoyed some entertaining rugby with backs and forwards combining effectively to maintain fourth place in the Yorkshire One table. Crocs took the lead after only five minutes, having earlier pushed Salem off their own scrum feed. Joe Stott released the back line and Callum Dunne drew a defender before passing to Josh Hunt. The prolific try scoring winger cut back infield and evaded several defenders to touch down. Callum Dunne converted. Salem drew level five minutes later. They were awarded a penalty for a high tackle and chose to kick to the corner. 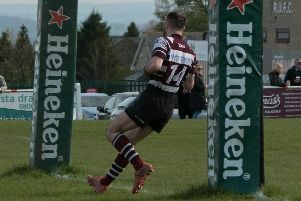 The line out ball was secured and they moved it along the back line, enabling Chris Clough to crash over for the try. The conversion made it 7-7. The home team retook the lead midway through the half with a sublime piece of finishing. Salem were offside and Crocs kicked to the ‘22’. The line out drills were working much more effectively this week and Jack Hammond’s deft off-load in another flowing back line move found his brother Billy, running a great angle at pace. He scythed his way through to touch down under the posts and Dunne converted. Crocs were playing with confidence and verve. A scoring chance was squandered when the ball was turned infield but after half hour Sam Ives ripped the ball in contact and found Jack Pilcher. He released Chris Vine who sprinted down the left wing before passing inside to Billy Hammond, who outpaced the cover to score by the posts. Dunne’s kick made it 21-7. From the restart, Tony Oxley powered his way into the opposition half and just before half time another flowing back line move from Crocs’ scrum feed resulted in Dunne touching down in the corner. Martin Hamer ran through several defenders from the restart and Crocs were maintaining their ascendancy in the scrum. Crocs continued to dominate after the break but were unable to extend the lead until midway through the second half. Chances were not taken despite extended periods of building the phases patiently. Dunne ran the ball back impressively from deep in his own half and, shortly after, Hamer had a try ruled out for a forward pass. A slick back line move then resulted in a knock on with the line open. Eventually, Crocs kicked a penalty to the corner and several phases later Sam Ives blasted his way over the try line, leaving defenders trailing in his wake. Dunne’s conversion made it 33-7. 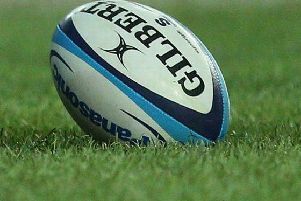 Crocs scored two further converted tries in the final 10 minutes. Pilcher smashed his way through the defensive cover and touched down between the posts and was then held up just short of the line. James Cooper continued the move and his adroit off-load enabled Billy Hammond to twist and force his way over the try line to complete his hat-trick.